Container Homes Depot Nigeria – Buy Container Houses. Design, Pricing, And More! Container Homes Nigeria – Buy Container Houses. Reliable Manufacturer. Design, Pricing, Delivery And More! 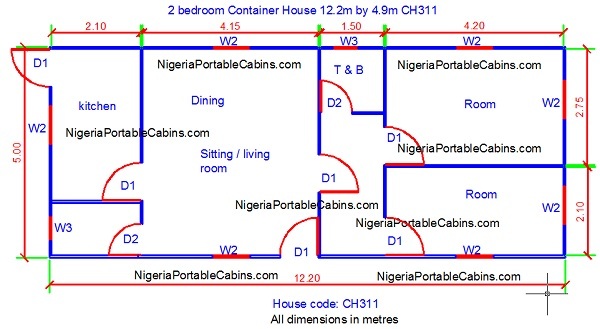 This Nigeria container homes depot provides all the information you need to buy the container building that's just right for you. Here we provide answers to common questions about container houses and how you can acquire as many as you need. 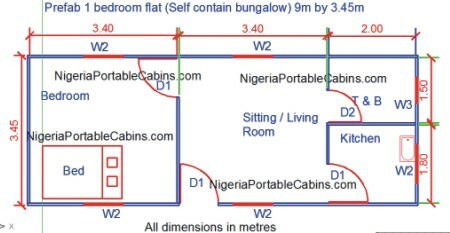 Let's start with the first obvious question: Do people really live in shipping container houses in Nigeria? It is if you buy it from a company that specialises in converting used shipping containers to residential and office accommodation. Most people would be surprised to hear that container houses can be comfortable residential homes. It's because there are three obvious challenges associated with using shipping containers for office or residential use instead of strictly for shipping purposes. width . . . at first glance. sunny day. Since Nigeria is a sunny or temperate country, many would conclude that the concept of using steel shipping containers for residential purpose is not a smart idea. The low prices of container houses make them attractive BUT you will need experts to convert them to lovely residential homes. The good news is . . . we build container buildings in Nigeria and deliver to customers all over Nigeria. So, how do we deal with the three challenges above? The common sizes of used shipping containers available in Nigeria are 20ft and 40ft containers. And the width of these commonly available used containers is between 7ft to 8ft. If you're looking for a container building for use as office building, these sizes may just be enough for that purpose. However, if the used containers are for residential purpose or for bigger office buildings, we resolve the width constraint by installing two or more containers side by side. For example, installing two 20ft by 8ft used containers side by side will result in a hall size (or house size) of 20ft by 16ft. And installing five units of 20ft by 8ft containers side by side would result in a steel building of size 20ft by 40ft. In like manner, we could install three 40ft by 8ft containers side by side and end up with a steel building of 40ft by 24ft. The second challenge with adapting used shipping containers as containers homes is the problem of high temperature inside the steel house. We address that problem by providing two options for insulating the container house. Option 1: Wall Insulation - This involves fitting the walls with insulated sandwich panels. The sandwich panels are rigid structures incorporating polyurethane foam in-between the walls. This provides good thermal insulation for the occupants of the container home. Option 2: Roof Insulation: The polyurethane or pu insulated sandwich panels insulate the walls of the used shipping container from the hot rays of the sun. What about the roof? The suspended ceiling used inside the container also provides some form of insulation. However, we can improve the level of roof insulation by installing Aluminium roofing sheet above the container home and with sufficient space between the Aluminium roof and the top of the metal container to provide some form of thermal insulation. Please note that this increases the cost of the container building. As noted above, the width of the steel building desired can be achieved by joining several containers side by side to increase the width. 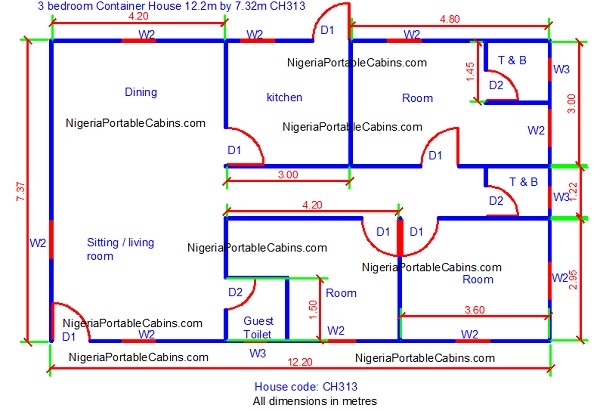 This creates one big hall or room that can be partitioned according to the building plan of the customer (see sample building plans above). We can construct any size of metal building or container building for you . . . residential or office accommodation . . . with used shipping containers as the starting point. You simply tell us what you want and we will build it for you. Want to buy container houses and take advantage of the low cost of home acquisition offered by container homes? Just fill the form below to request a quote.